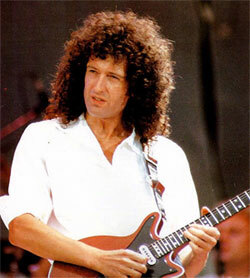 Brian Harold May was born on 19th of July 1947 in Hampton, Middlesex, in the UK. Brian attended primary school in Feltham during which time he showed an interest in music and his parents registered him for piano lessons, which Brian actually hated. When Brian was six years old he started learning to play the ukulele. Brian got very good very quickly and soon he wanted a guitar. A Spainish guitar was given to him as a birthday present, but it was too big for him, so he went and modified it. With his newly built guitar Brian was listening to, and accompanying records which he played. He quickly moved from playing chords to more advanced details. As the time went on and as he played the existing guitar he discovered, that his guitar wasn't good enough to play music he liked. He didn't have much money and the type of guitars Brian wanted were too expensive. Brian and his father decided to build a guitar to fit Brians needs exactly. This was to become Brian May's famous "Red Special" (or fireplace guitar). The guitar took about 18 months to build and cost roughly 18 pounds at the time. Brians friends and schoolmates loved the guitar and offered to to buy the guitar from him. As Brian used the new guitar, standard plectrums was letting him down and he tried to find a form of plectrum / pick which would be the best for the sound he exactly wanted to hear. Brian found the only one pick, which could do that – an ordinary English sixpence. Brians guitar playing constantly improved and when he was 17 he founded a group with friends, Dave Dilloway and Tim Staffell. The group was named "1984" after the name of a Sci-fi book. The band played locally performing in halls and schools. Within 18 months brian went to Imperial College in London to study astronomy and Physics. Brian began composing songs around this time, covering a wide variety of styles, but usually wrote ballads and hard rock. He still played in the group 1984 and even supported Jimmi Hendrix at one point. However the group did not last too long, as Brian needed time for study and the band itself felt there was not any potential for the group and they disbanded. Brian stayed in contact touch with Tim Staffell and they agreed that they missed playing as a group. They posted up a note on a college notice board stating that they needed a drummer. They organised Drum-off competition, and one of competitors was Roger Meddows Taylor, from which the group Smile was formed and later Queen. (You can read the main bio to see what happed in relation to Queen from here...) Brians distinctive guitar style and excellent playing allowed Queen to launch them selves onto the music scene. Brian also wrote some of Queens great numbers from rockers such as Tie your mother Down and We Will Rock You to ballads like Who wants to live Forever. Brian remained an active musician after Freddies death in 1991, releasing solo albums and taking part in events such as 46664. 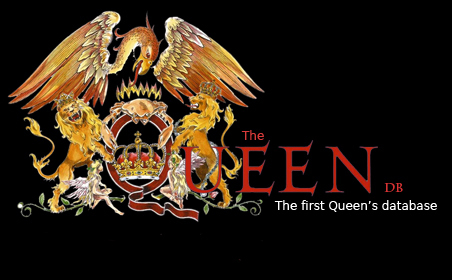 Brian has three children Jimmy, Louisa and Emily Ruth, and remains heavily involved with Queen related projects such as the Queen+ Paul Rodgers tour and the We Will Rock You musical which is running in places like UK, USA, Australia and Japan.